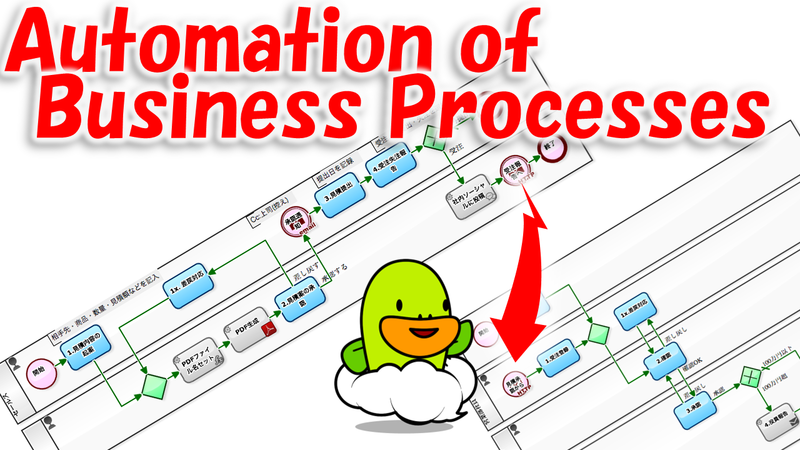 "Episode 518: What is Automation of Business Process (Part 1)"
"Episode 519: What is Automation of Business Process (Part 2)"
"Episode 520: What is Automation of Business Process (Part 3)"
regarding automation within a "Business Process". In this (final) article, I am going to organize about the automation between Business Processes. Until now, we discussed focusing on "individual Business Processes" such as "Estimate Approval process" and "Order Receipt process". However, in order to promote automation (improvement of productivity) in the company-wide, we must consider about "connectivity between Business Processes". On such a stage, it is a shortcut for improvement discussion that enumerating the internal "Business Processes" as much as possible in advance. That is, the overall viewing would reveal the position and dependency of each Business Process, and the way it should be of the "inputs" and "outputs" of each Business Process would become clear. Along with, it would also clarify the operation method and direction of improvement that the responsible person (Process Owner) of the Business Process should aim for. So, what kind of "Business Processes" are there inside the company? It goes without saying that it varies greatly depending on the business contents and organization size. At the same time, you should suppose that there is no one who can grasp all the business details in the company. In other words, regardless of who is in charge of "enumerating Business Processes", on-site hearings in certain extent will be required. And when enumerating the survey results, it is important to enumerate by categories so as to make it easy to see the whole. 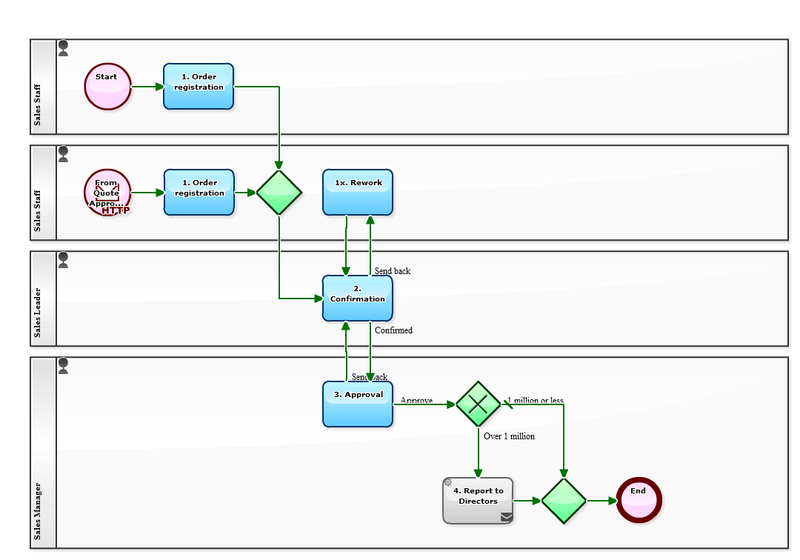 As a methodology in practice, it is necessary to map in-house Business Processes utilizing the cost categorization upon calculating the profit and loss of the compan such as "manufacturing cost", "selling expenses" and "general administrative expenses", in addition to the Process classification method of the research institution. In such a case, you should consider automatic passing over Issue data from "Quote approval process" to "Order receipt process". In other words, it is possible to save time and labor of inputting data by making the system that an Issue which became "ordered" in the "Quote approval process" to start flowing to the "Order reporting process" automatically. In addition, for the data items to be inherited, it is a good idea to select the data required for the work in the perspective looking from the subsequent process (child process) toward the previous process (parent process). In this example, the "Throwing Message Event" is placed at the end of the Quote Creation and Approval process, and the content to be connected to the "Message Start Event" at the head of the Order Report process is set. And it has been set the following five data to be passed over. "Why don't you put it together into one?" Certainly, if you define it as a "long Business Process", you do not need to connect between Business Processes. 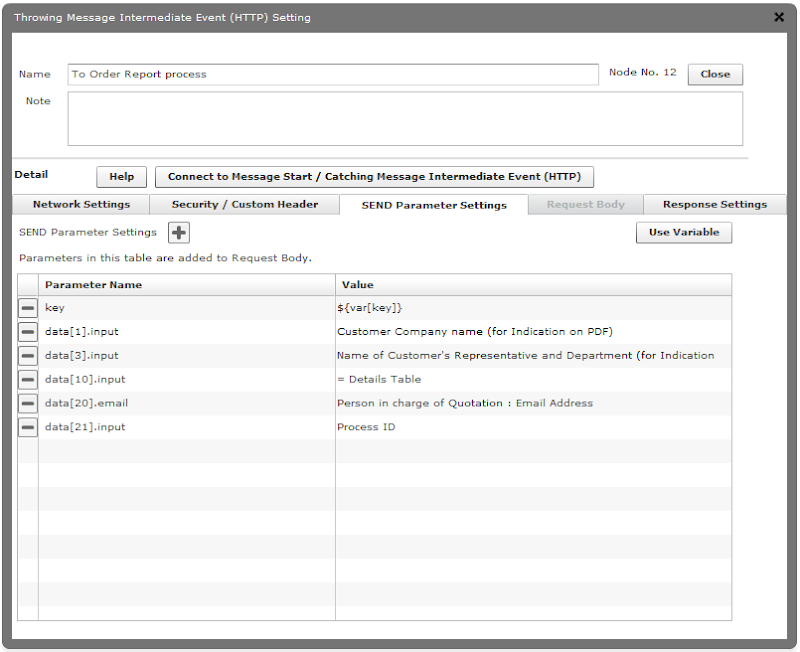 In this example, you can combine the "Quote Creation and Approval" and the "Order Report" into the "Quotation submission and Order reporting process". However, there are some problems with this "long Business Process". The scope of responsibility of the responsible person (process owner) is widened. The number of concerning person increases and it takes time to form consensus on improvement change. Time and labor for testing operation increases. 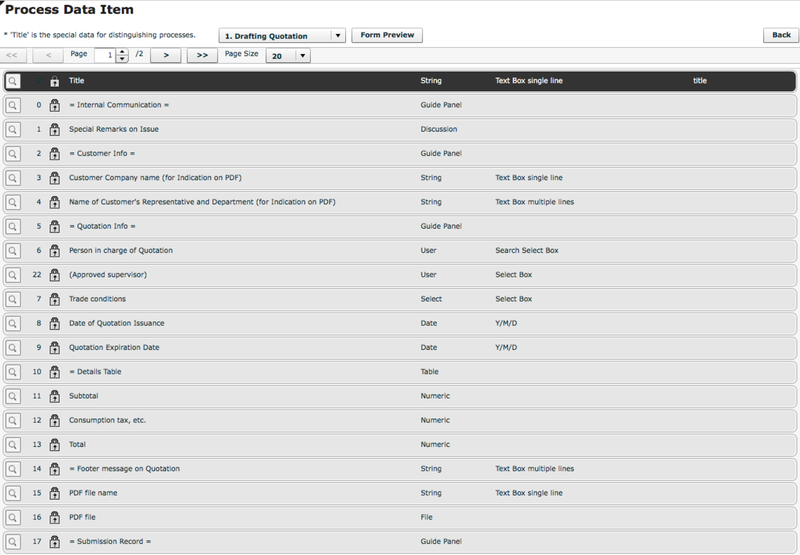 The number of data items increases, making it difficult to aggregate. The number of administrators to control error Issues increases, responsibility becomes obscure. In other words, if day-to-day Process improvement is expected for the responsible person (process owner), it can be said that it is necessary to classify the Business Processes in small units to some extent. Joseph Schumpeter, an economist, said there is five types of "Innovation". The introduction of a new method of production. The opening of a new market. The conquest of a new source of supply of raw-materials or half-manufactured goods. The carrying out of a new organization. It is a classification that is still widely used, although it was advocated over 100 years ago. And it can be said that the business improvement on a daily basis would only lead to "#2 The introduction of a new method of production," and "#5 The carrying out of a new organization."